I recently read J.D. 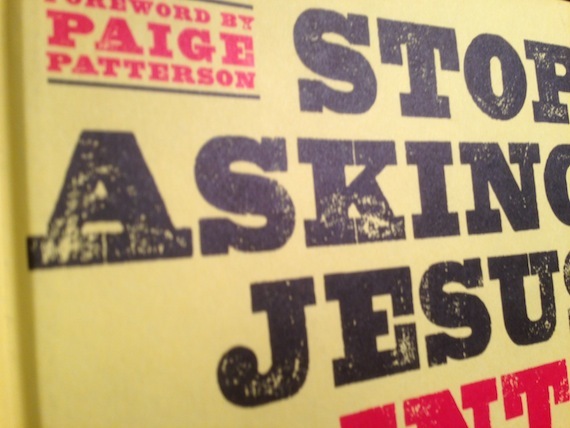 Greear’s new book “Stop Asking Jesus Into Your Heart.” I was drawn to the book because of the confusion the term can sometimes bring when explaining the gospel to kids. J.D. Does a fantastic job addressing the topic of eternal security in a practical and theologically correct way. His book is a fantastic read for leaders and those wanting to think more about how we live our faith. He covers the sacrifice Christ paid for us, what is belief, what is repentance, once saved always saved, doubt and baptism. 5. There has been more and more of an emphasis on the gospel in the church world over the past several years, but it really hasn’t fully made its way into Children’s ministry and youth ministry yet. Why has the gospel-centered movement not reached youth literature? I am not familiar enough with the field to make too many sweeping assertions, but I can say that some groups are doing good work here. For instance, Lifeway’s Gospel Project is producing some excellent gospel-centered literature for children. The bottom line is that some things take time, but good things are happening. 6. How do we guard against the gospel being used as a catchphrase by those who may not understand the implications of the gospel, but are using it as a church growth strategy? From your book, I believe you were addressing this in the area of assurance. How do we avoid it in other areas of Gospel ministry as well? The gospel can always be high-jacked by those who want to box it up and use it for their own ends. Gospel-centeredness is a hot topic right now, so there may be some churches or pastors who are riding the “gospel-centered” train simply because it is trending upwards. If that is the case, we will know it when they part ways with the movement if it loses steam. But if they are using the gospel for some other purpose, then what they are preaching is some other gospel, or as Paul said to the Galatians, not the gospel at all. The gospel is the proclamation that Christ has done everything necessary to reconcile us to God. He lived the life that we were supposed to live, and died the death that we were condemned to die. Those who believe in him and repent of their sins will be saved because of his substitutionary sacrifice. That’s the gospel. And as long as that is the content of preaching and teaching, as long as that is driving the mission of the church, it will be impossible to use that story as a catchphrase for my own ends. Does preaching the gospel lead to church growth? Jesus said that it would. He said that he would make us fishers of men, and that our boats would overflow like Peter’s did when he called him. Every church that is concerned for the souls of the people around it should care about church growth. Why would we want to reach less of the people around us for Christ? But church growth is the fruit of the gospel, not its root. Our concern ought to be on the faithfulness of our ministries first, and their fruitfulness second. It is possible to grow crowds without preaching the gospel, so a large crowd is no guarantee we’re being faithful. And there are certainly seasons—I have had many—when I preached faithfully with little fruit. It bothered me, as not catching fish should bother any fisherman, but it was not in itself proof I was not being faithful. Fruitlessness should not settle the question of faithfulness, but it should certainly raise it. 7. As a family pastor, I believe you can be saved at a very early age. I was myself at age 5. In the Scripture it says, “Repent and be baptized.” What restrictions (if any) do you have on children being baptized at your church, and why do you have those restrictions in place? As you mention, baptism and repentance go hand in hand. Baptism signifies that we have repented and believed in Christ, and that the Spirit of God has given us new life with him. By being baptized, we identify with Christ’s death and resurrection, trusting that he will one day raise us from the dead to live with him forever. That is the core of what baptism means, and anyone being baptized should—to the best of their abilities—understand that. That includes children. Can a child of 18 months truly understand repentance and belief? I doubt it, which is why we don’t baptize 18-month-olds. But is there a magic age, then? Is it 4 years old? 7? 13? At our church, we do not have an explicit age restriction, but we do require that those who are to be baptized understand what it symbolizes. In practice, that usually makes the lowest age somewhere around 5. (I baptized my own daughter at age 5.) But the number is not nearly as important as the substance of the person’s belief. I firmly believe that baptism is only for believers, but it should be something we grow from, not toward. There were several times in my life after I had been baptized that I had “awakenings” and defining moments that made my previous beliefs seem pale. But that didn’t invalidate the sincere profession of faith and the baptism that accompanied it. 8. Although this book is still fresh off the presses, is there anything you would already change based on further reflection or feedback from others? If there were one thing I would change about this book, it is that I would have written it a lot sooner! The concept for this book first struck me after I preached a sermon about assurance a few years ago. Dozens of people responded by telling me that this was a major issue for them. And as I mention in the book, it was a major issue for me for years, too. I wrote the book because I sensed that there was a great need for someone to address the issue of Christian assurance. Since it has come out, the book has prompted a lot of the same positive responses as that initial sermon. I also wish I had emphasized involvement in a local church more as essential to assurance. God gave us the church to help us see more accurately what God is doing in our lives. So appreciate this book that J.D. wrote. If you have not picked up a copy do it today the Kindle version is just 4.99 go get it now.